What relationship have Israelis established with nature over the past 60-plus years? Every child has been hiking in Ein Gedi, celebrated Lag BaOmer from the top of a mountain, and taken a class in yedidat ha’aretz (knowledge of the land). Yet the Yarkon River which runs through Tel Aviv is so polluted it killed four Australian athletes at the Maccabbi games in 1997. Ironically, the Dead Sea is dying of thirst — it's disappearing at a rate of more than one meter (3 feet) per year. A concrete jungle covers most of central Israel from Tel Aviv to Jerusalem, Ashkelon to Haifa. Is this truly our Zionist dream? At its core, the early Zionist dream was a dream of reconnection to the land from which our ancestors were torn almost 2,000 years. Whether a religious connection to Jerusalem and God’s promise of this land, or a cultural nostalgia and connection to an ancestral home, the land of Zion was the key. When the World Zionist Congress debated the Uganda option, one fact was unmistakable: A Zionist revolution could not be successful unless it had Zion at its core. The Jewish people were born of that land. Like a salmon migrating from the middle of the ocean to the exact riverhead at which it was born, the Jewish people are called to the land. The deserts, the hills, the rivers and the sea beckon to us from a young age. The intrigue of Abraham’s desert existence (now large suburban homes), the people crossing the mighty river Jordan (now a trickle), the struggle at Masada (which is deteriorating annually from pollution) — these images are imprinted on the minds of Jewish people worldwide. This connection runs deeper than can be taught through education. When, at the age of 16, I stepped foot in Israel for the first time, I smelled the air, felt the soil and immediately felt at home. It is a feeling that in my whole life, I have only felt in three places, my parent’s home, the hof (beach) at my machaneh (camp), and now in Israel, felt strongest in the desert. Looking back after 60 years of state building, something has gone terribly wrong. For many years, , our people were threatened, their lives at risk, and development was the only answer possible. Israel, as the last hope for the Jewish people, had to be strong. But love of land has been usurped by a need for consumerism and Western standards of living. Immediate political stability has overshadowed the need for sustainable practices. And while conflicts continue and economic challenges persist, new environmental threats to the land and people of Israel have emerged. The land of Israel, a land for which we pray at every prayer service and meal, has suffered and continues to suffer. To ensure its basic survival, Israel must begin to address the multitude of environmental issues that plague its future, and we, as Diaspora Zionists and Jews who love the land and people of Israel, have an obligation to take the lead in making it happen. Though the agrarian roots of early Zionism have long been replaced by a high-tech Westernized economy, it is not too late to salvage the meaning of religious and early Zionist thought. As the entire world awakens to the dangers facing Creation through environmental destruction, Israel and the Jewish people must act to create a sustainable society in Israel and beyond. For thousands of years, our culture, our laws and our spirituality have centered on protecting and praising the natural world and the land of Israel. The ancient law of baal tashchit forbids wanton destruction even in a time of war; Sukkot is one week every year when we are commanded to sleep under the stars in temporary harvest dwellings; and, of course, on Tu B’Shvat we’ve celebrated the lives of trees by planting new ones in the land of Israel. Many argue that environmental issues still cannot be addressed in Israel with so many security and economic threats looming. However, environmental threats are paramount to security and economic threats — especially in a country as small as Israel. For example, with water levels dropping annually and demand increasing in Palestinian territories as Israelis usE proportionally more water than the Palestinians, Israel will have to find new conservation methods if they hope to ever reach an equitable and sustainable peace. Much of Israel’s best agricultural land is being eaten up as urban and suburban sprawl encompasses most of central Israel, and global climate change threatens to turn much of what’s left of Israel’s arable lands into desert. This decrease in agricultural output, combined with continued population growth, is leading to a dependency on foreign imports — which is in iteself a threat to Israel's economic security. Only through a refocusing of Jewish and Zionist ethics to include love of the land and a drive to preserve it can we ensure the future of Israel and the Jewish people. By focusing Jewish advocacy on the issues facing Israel and the world today — such as water depletion, loss of open space and global climate change — can we add our unique and progressive voice to Israel and the Zionist movement. A small but strong environmental movement has formed in Israel over the past decades. Dedicated individuals are working to change Israeli society through education, advocacy and law. Growing quickly, this movement is getting stronger every day. In North America, a growing number of environmentally conscious Jews are banding together to add their collective voice to those concerned about Israel's environment. Led by the Green Zionist Alliance and by leaders throughout the Jewish community, this growing voice is looking at ways to help work with Israel to protect her environmental future. In my work as a Jewish environmental educator, I have seen thousands of children and adults who have had the same epiphany that I did — the realization, that as Jews and as human beings, we must fight for the preservation of the planet and the land of Israel. Many have made aliyah with the goals of pioneering this new understanding; others joined to form the Green Zionist Alliance. Actions speak louder than words! In addition to becoming involved with the Green Zionist Alliance, remember that environmental issues are global issues. Along with fighting to protect wild spaces in Israel, we must change our own actions on this continent, actions that affect global security as a whole. We are connected to the land and all lands are connected to each other. Make a change in your life today to help protect the future of our people and the world. Noam Dolgin is a former executive director of the Green Zionist Alliance. What is your favorite natural area of Israel? "You are not obliged to finish the task - neither are you free to neglect it." Aytzim (Green Zionist Alliance, Inc.) is classified by the IRS as a tax-exempt nonprofit organization under Internal Revenue Code Section 501(c)(3). Aytzim.org is a carbon-neutral website hosted by DreamHost and is best viewed in Firefox. 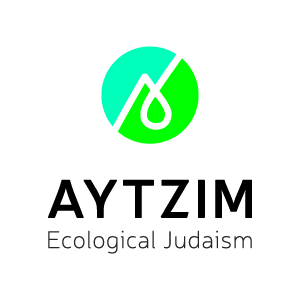 Aytzim™, Ecological Judaism™, Jewcology™, Shomrei Breishit™, Rabbis and Cantos for the Earth™, Green Zionist Alliance™, The Grassroots Campaign for a Sustainable Israel™, Green Zionism™, Green Israel™ and Green Israel Summit™ are trademarks of Aytzim. Copyright © 2018 Aytzim and its respective contributors. All rights reserved. May not be reproduced in any form without written permission. No quotes may be used in any media without attribution Aytzim. The opinions expressed and those of the authors do not necessarily reflect the views or positions of Aytzim, its staff or lay leaders. in part due to support from Mercaz/Masorti Olami, Hazon and Jewcology.